The team of Humboldt university in Berlin won the first Greek RoboCup championship on 5 May. In the final they defeated the group of “SPQR” ( University of Rome) after a nerve-racking match with a penalty kick goal with 1:0. Because of technical problems external robots had to be lent shortly before the final game, since two of the own robots refused the service. “Without the short term assistance of our Greek hosts it would not have been possible to win this game, so team leader Heinrich Mellmann. There was an advantage of the Standard Platform League visible, in which the tournament was aligned: Contrary to most other robot football leagues, this league continuous with the same type of robot, one scarcely 60 cm large two-legged robot. The team from Berlin improved again with the victory in Greece, after it reached already the fourth place on the European championship in march. The Nao Team Humboldt is a project of the working group – artificial intelligence of the computer science faculty in the Humboldt University of Berlin. 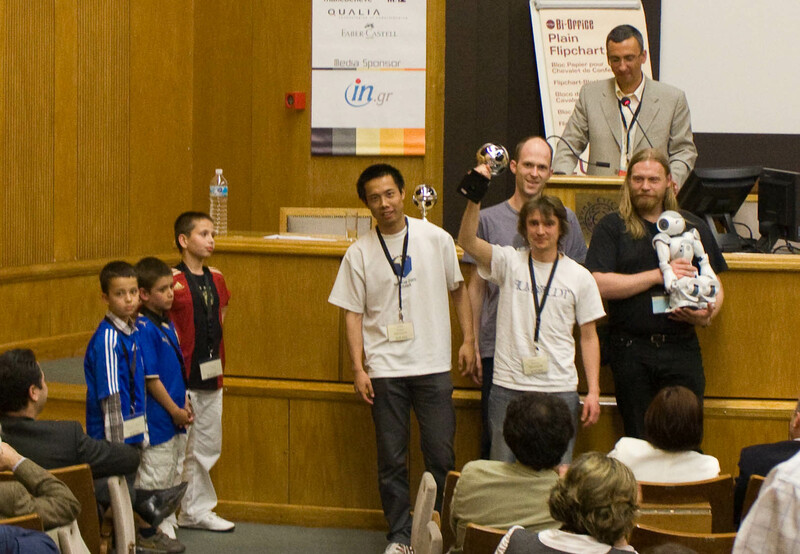 The championship took place in the context of the RoboCup, an international initiative for the promotion of the research within the ranges artificial intelligence and robotics. The vision of the RoboCup is to develop a robot team up to the year 2050 which can defeat human football world champions then. At the same time are different main points of the computer science examined, which realizations are flowing into science and industry. The Greek RoboCup championship took place in the context of the sixth conference for artificial intelligence in Athen, which presents current realizations of the AI until 7 May.